Whenever you cast a spell named Exhume, you may sacrifice CARDNAME. If you do, target player sacrifices a creature. : Until end of turn, CARDNAME becomes a 4/4 blue and black Vampire creature with flying and lifelink. He's still a planeswalker. Prevent all damage that would be dealt to him this turn. : You get an emblem with "Whenever a creature you control attacks alone, draw a card unless defending player discards a card." : Gain control of up to three target permanents. 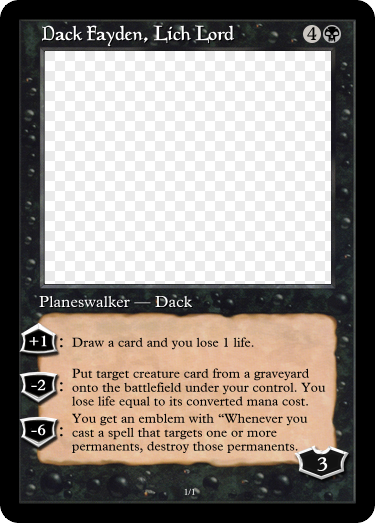 To push the "loners" theme in Avacyn restored. Up: Ehhhh. Parasitic A + B needs a good payoff and good flavor, usually (no, PW decks do not count). This is neither of those. Tesagk: Caught me in the middle of editing, lol. I think the current up should be a smidgen more adequate. Tesagk : Caught me in the middle of editing, lol. I think the current up should be a smidgen more adequate. An up is constructive feedback for the post above you (hence why it's an "up"), which I think my write-up is. If something is confusing or unfair, just let me know and I'll address it at a reasonable time. Pretty sure all of the previous ups have been more positive than negative. I got that, but if you look at the comments everyone else has shared, it's still mostly positive, with only an occasional "maybe it should do this instead." Yoshi's comment tore into my card. I resent your assumptions about what I can and cannot take, please leave your assumptions to yourself. Up: Very good mirror of the original, with the Vampire/emblem/get 3 things pattern intact. The emblem seems very powerful though, especially in multiples. maybe? , : Create a 1/1 white Soldier creature token with lifelink. I'll just point out that Yoshi's critique is on the really polite end of the spectrum of critique one could get in custom magic land and leave it at that. 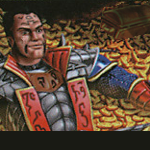 UP: Clever use of Exalted colors and keeping Sorin very similar in use while making him work in another color. No real complaints here. Whenever a creature dies, you may create a token that's a copy of that creature. "Ravnica outlived one apocalypse of otherworlders, and it shall outlive another." Tried to do an unusual take on the token production while remaining sufficiently Selesnya. EDIT: Ninja'd, see gluestick248's post instead. Tesagk: To be honest I hadn't even looked at half the ups for my cards (I made them and was done with them why should I care what anyone else thought, guess I've acclimated to internet thinking), but looking back at least 2 of my ups are quite critical. Up: It seems quite a bit overcosted considering at best it is a counterspell that counters only counterspells with scry: 1, but that assessment is based upon it being a rare. 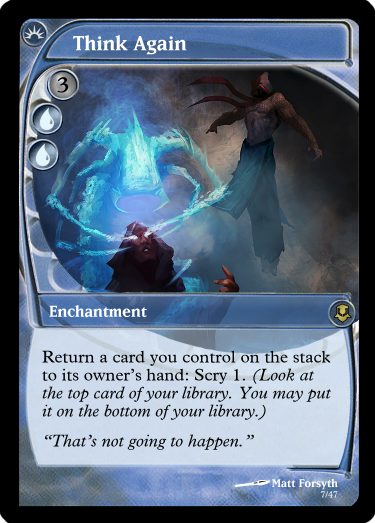 It does make me have to ask if a card is removed from the stack but a spell is not what does that mean (this might make up for the cost?)? 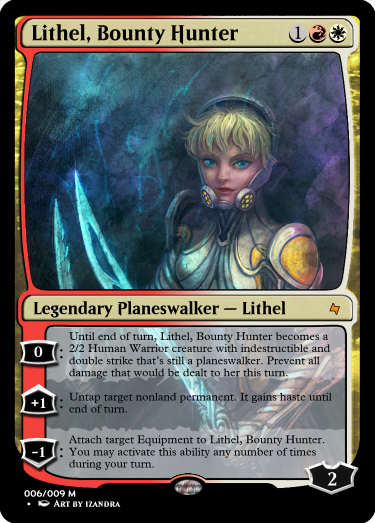 Also, and understand I'm pretty sure I've already crossed this line, this probably crossed the line from being a planeshift to being an alternate. 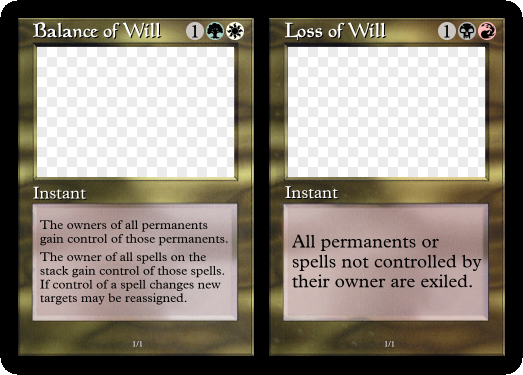 I see the future of Beguiler of Wills going two ways so why not a split card. I will definitely look at the Up comment on this card, I shot in the dark on both the CMC and wording on this as I couldn't find anything similar in gatherer even though I'm sure something like this has been done somewhere before. Up: The wording is slightly off on both sides. The BR side could just be "Each player exiles all spells and permanents they control but don't own." I'd like this more if the two sides were a little bit more different - generally, split cards are better when both sides work in different situations. This does still work balance-wise, but I'm not sure that it's going to be that great with regards to gameplay. I'm also uncertain of whether BR can counter spells like that, as niche as this case may be. I do like the flavor component going on here, though. That was hard, but fun. Up: Interesting take, but I think it’s just Bolts 5-8 in every burn deck. I do want to see more Likeness, to see what else can be done with it. Battalion — Whenever Tajic, Mazerunner and at least two other creatures attack, put a +1/+1 counter on each attacking creature you control. Sacrifice an artifact named Boros Cluestone: Put two +1/+1 counters on Tajic. Up: It does directly reference the Cluestone, but it doesn't really reference the mechanics at all. So I guess it works, it's just not what I would have expected to see. Whenever a creature dealt damage by Duke Sengir this turn dies, put that creature onto the battlefield under your control. It’s a vampire in addition to its other types. : Other vampires you control gain indestructible until end of turn. Up: Seems a solid card, although personally I always figured the Baron was deposed rather than gaining power. UP: I feel like if you take away any mention of artifacts, it kind of stops being Dack flavorfully and maybe even a bit mechanically. The card is mechanically sound and the ultimate is a cool way to promote running other colors to target things besides creatures but I feel like this could be any Black planeswalker and not necessarily Dack. Also, for what it's worth, I'm a really big fan of your usage of the old border, impspiritguide . So Little Girl is blonde and can become a distinguished hero, right? Sure, let's roll with that. For a while I considered it just flat out making it Samus Aran, but I think it's more in the spirit of MTG to do a homage instead. Next: His ability's a real mess, but his flavor's actually pretty believable, so Timeshift M'Odo, the Gnarled Oracle. UP: That third ability is a super-interesting idea, especially because all the equipment fall off after Lithel stops being a creature, meaning you need to have the ability to both grow counters with the second ability, but also fire her up and then use a bunch of counters at once to make her a Voltron monster. The abilities are in the wrong order, but that's not a big issue. Up: Mirrors M’Odo very nicely. 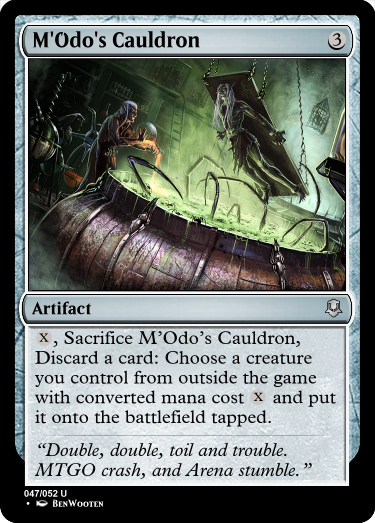 3 mana seems right to cast, and the only thing I’d change is exiling the Cauldron instead of sacrificing it. If an opponent would gain control of a creature you don’t control, gain control of that creature instead. If an opponent would control a player, you control that player instead. * You control target opponent until your next turn. Exile Bolas’ Slaveminder. Up: I love the added versatility. The effects are powerful, but so expensive or niche that I don't think they break the card. Especially if it's mythic rare, as I would assume. 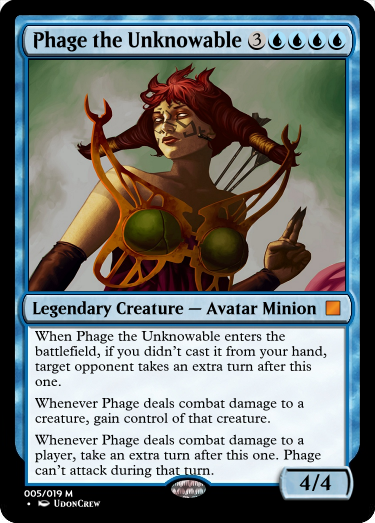 Up: Nice take on a blue Phage (I think it could cost less but it would lose flavor points). Up: A Singularity you don’t have to keep paying for. Wonderful. But it does match the ability and fun level of the original, so it’s a fitting design. You may pay instead of paying equip costs. , : Search your library for an Equipment card, reveal it, and put it into your hand. Then shuffle your library. Up: I like the concept but it is way too much Johnny on a single low costed artifact I. To be honest the ability to reduce equip costs to 0 is probably a CMC to begin with. The search aspect is probably approriately costed, but overall too much power in a first or second turn drop. If I was to try to fix it I'd suggest using Auriok Steelshaper's "Medallion" style ability and simply reduce the equip cost by one. Dropping it to 0 for things like Grappling Hook, Heartseeker, Moonsilver Spear, Ogre's Cleaver, Scythe of the Wretched, Spellbinder, Surestrike Trident, Sword of Kaldra, or especially Worldslayer is a very powerful ability and should be costed appropriately. 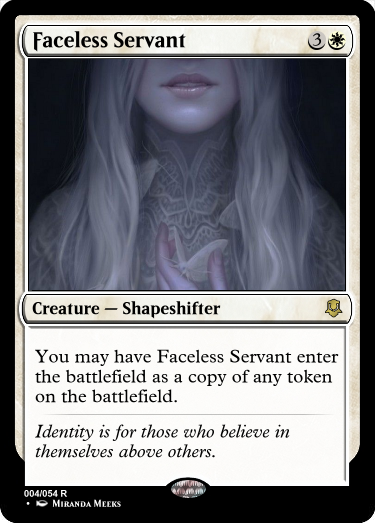 If it wasn't a silverbordered card I'd have included an ability stating something to the effect of "If ~this~ would be sacrificed then exile it rather then placing it into the graveyard. ", as it is I didn't think that was necessary. 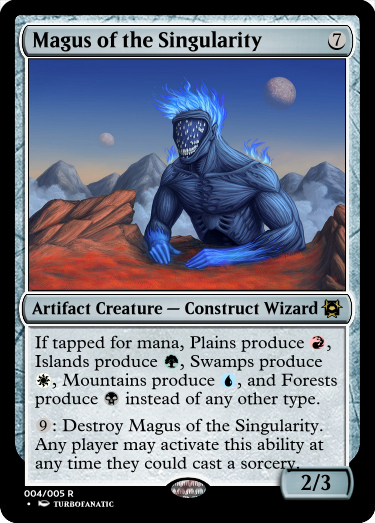 ^^ If Dominaria can survive the Sylex Blast I'm sure magic will be ok. I think this counts as a futureshift? I'd like to see an alternate Yixlid Jailer. UP: Cost on par with Planar Cleansing, though considering how cheap you can get Hour of Revelation for, I'd have thought the Suspend cost would be lower and just take a few more turns instead. Either way, it works, and I like the flavor of requiring colorless mana. Whenever an ability on a card in a graveyard is activated or triggered, Yixlid Torturer deals 1 damage to that card’s controller. Up: I like the ‘punisher’ version of the Jailer. Mono- Zombies are a bit weird, but definitely not unheard of. Exile a spell you control: Put a charge counter on Mizzium Thermoregulator. Remove three charge counters from ~: Add . You may spend this mana to cast spells from exile. Up: The idea of changing the ability to cast one card from exile at a time to doing multiple is a cool idea, but the increase in flexibility doesn't make up for the lack of power, as well as the fact that all you're doing is delaying spells until later. NOT AN ENTRY (Sorry don't have time this morning). Up: Nevinyrral's Ruinous Blast - good take given the now altered history of Nevinnyral. Had to look it up, the original disc didn't blow up it simply removed all mana from the surrounding area (rumor was the un-playtested version put lands in the grave as well), aka no magic, no spells, no artifact, no futureshifted cards. Up: Mizzium Thermoregulator, as written this is ok. Perhaps even undercosted as suggested by gateways7, but bear in mind the card never gives you the ability to cast the spells you exile with this artifact. On the other hand if you added the "You may cast that card for as long as it remains exiled." to the first ability or even changed the second ability's ending to "You may spend this mana to cast a spell from exile. After activating this ability you may cast the spells you exiled with this artifact." 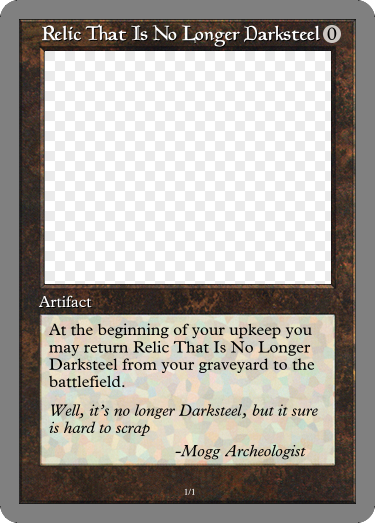 then it is way undercosted, I could almost guarantee it would be restricted in Vintage (it would be continuously free mana on an artifact costed under which is small for Vintage). If you added "You may cast that card using only mana from ~this~ as long as it remains exiled." then I'm not sure where it falls on the spectrum. Up: I like this a lot as a way to give cloning of some sort to mono-white - I could see this in Future Sight, actually. It could stand to be a bit cheaper - even if one considers that you could copy noncreature tokens and enemy tokens, I still think this could be - after all Wake the Reflections does cost . When CARDNAME enters the battlefield, return X lands you control to their owner's hands, then you may put X land cards you own from outside the game on the battlefield tapped. Landfall - Whenever a land enters the battlefield under your control, create a 1/1 green Plant creature token.